"Why send flowers when you can send biscuits instead?" 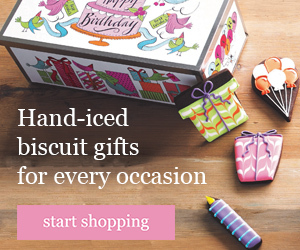 Biscuiteers provide beautiful hand crafted biscuits, chocolates and cakes suitable for any celebratory occasion. Hotel Chocolat offers the finest chocolates money can buy. Using quality, authentic ingredients is an ethos that has been fundamental at Hotel Chocolat since the beginning and the 'no nasties' approach bans the use of additives such as hydrogenated vegetable fat and artificial colours in order to let the pure chocolate flavours and aromas through. Hotel Chocolat Tasting Club vouchers make great gifts. Thorntons, the highstreet chocolate shop, also has a selection of fine wines, flowers, hampers, and other gift ideas. Montezuma's specialise in bringing together fantastic quality ingredients in an innovative fashion to create delicious and unusual chocolate products. The quality of their ingredients is their priority and this means that many of the products are organic. All of their products are made by them in West Sussex and they have a strong ethical stance and conduct business under their 'trading fairly' policy. This ensures that their suppliers, customers and all those they come into contact with are dealt with properly and fairly along the way. Montezuma's were launched in 2000 from a tiny shop in Brighton and have since opened another 4 shops, and an online store which has gone from strength to strength. Since 1926 Godiva has been the premier maker of the fine Belgian chocolate. Welcome to www.lovehearts.com! An imaginative range of gifts and ideas based on the universally loved brand. Whether you're celebrating a birth, birthday, wedding or looking for a special way to tell someone how you feel, then there's no better way than to say it with sweets. We are unique in the wedding market. We are the only company that makes and sells JUST MARRIED and MARRY ME wedding favours and Love Hearts. Cadbury Gifts Direct - the simple, convenient way to gift Cadbury chocolate. Choose from a wide range of delicious Cadbury products including many not available in shops or supermarkets. Features a 'pick and mix' section to create your own unique Cadbury hamper. Create your very own unique and customised cakes, boxes of cupcakes or helium balloons at bakerdays. They make it simple to choose a design, size and delicious recipe, and then personalise it with your own photos and a special message. An award winning website from Chocolate Trading Company retailing the widest selection of premium chocolates from around the world, from over 15 leading chocolatiers. All categories of chocolate are available from single origin gourmet bars to stylish assorted gift boxes and unique novelties. They have some amazing Easter Eggs and Mothers Day gift ideas. You have given chocolates before, just never like this. zChocolat brings you a sophisticated and unforgettable gift. A collectible wooden box, decorated with engraved quotations and beautifully designed labels, contains a delectable assortment of the finest quality French chocolates. Combined with zChocolat.com's five star quality services, your gift will convey how much you treasure your relationship.